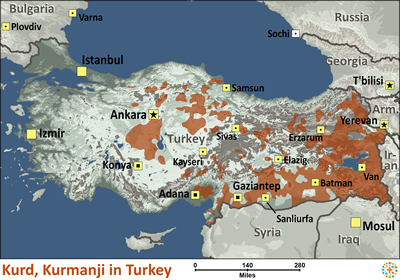 The Northern Kurds of Turkey live in the most rugged part of Kurdistan. They are located near the Turkey-Iran border, and eastward along the Iraq and Syrian borders. In the mountain regions, winter temperatures drop to -30C. In the summer, they reach 45C. Water is scarce; and malaria, tuberculosis, and trachoma are persistent problems. Kurds are divided by both outside influences and internal strife. In spite of their longing for a united Kurdistan, the people have not yet initiated any political or liberation movement. Historical trends have driven them apart and accentuated their differences. However, since 1965, these proud and fiercely independent people have made a clear return to their roots. The urge to speak Kurdish is becoming a catalyst for more and more educated Kurds. Although they have suffered set-backs since the Gulf War, this nationalism is laying the foundations for a Kurdish cultural and literary revival. Kurds in Turkey make their living in the same way their relatives do in Iran and Iraq: farming, and raising cattle and goats. Although a few Kurds still live the semi-nomadic lifestyle of their ancestors, most now live in small villages of less than 2000 people. Although Kurdish farming techniques are somewhat archaic, they are now being integrated into the Turkish capitalist market. Cotton, sugar, beets, and tobacco, are replacing the traditional food crops. The Kurds grow them for the Turkish market and for export. Kurdistan is also the main source for cattle, sheep, goats, and animal products in Turkey. Kurdish agriculture has changed little since the Middle Ages and is far behind the rest of Turkey. Large families are the rule and most households have at least five or six members. Disintegration of the tribal structure began at the turn of the century and entered its final phase in the seventies. Massive migrations to the towns, as well as other cultural and social changes, have contributed to the extinction of tribal society. Schools are ill-equipped and there are too few of them. Medical care is inadequate in the towns and almost non-existent in the rural areas. Nearly all Kurds are Muslim, most being Shafiite Sunnis, and embraced Islam following the Arab conquests if the seventh century. Although Kurds are predominantly Sunnis, there is stormy hostility between the Sunni Kurds and the Shi'ite Kurds. These differences have class overtones, and the lower class minorities are associated with the more unorthodox sects of Islam. These have proven to be the most fervently rebellious parts of Kurdish society. Even among the Sunni Kurds, there are traces of an earlier pagan and violent type faith which sets them apart from other Muslims. In the rural areas, a few still believe in jinnis, demons, and elements of animal worship. Mullahs (Muslim spiritual leaders) play an important role in the social and cultural life of those living in the country. Religious fraternities operate throughout Kurdistan. In the past, some influential sheiks (spiritual leaders) even became members of parliament. However, as time went by, their authority began to crumble. Today, their spiritual and economic power is being challenged. The Kurds have followed Islam for many years. Although the New Testament is now available in their language, there are few known Northern Kurd believers. Physically, the Kurds live in very poor conditions. Good water supplies are scarce, and they are exposed to diseases such as malaria and tuberculosis. Politically, they are oppressed by the government. They need the liberty to educate their children in their own language. * Ask the Lord to call qualified Christian doctors who are willing to go to Turkey and share their medical expertise as well as Jesus Christ with Kurds. * Ask God to strengthen, encourage, and protect the small number of Kurds who are Christians. * Ask the Holy Spirit to soften the hearts of the Kurds towards Christians so that they will be receptive to the Gospel. * Pray that God will open the hearts of Turkey's governmental leaders to the Gospel. * Ask the Lord to raise up a strong local church among the Kurds of Turkey.View Kurd, Kurmanji in all countries. Location in Country: Widespread, especially east and southeast.